How's the cablecar doing? Are many people using it? You'd think it might need a Freedom of Information request to find out. But it turns out TfL are now publishing weekly ridership data for the Dangleway on their website, if you know where to look. Here's how it looks. In the week after the Paralympics there were about 50,000 passengers, then last week about 30,000 passengers. Inbetween there's been a gradual decline in usage, as the weather's got colder and sunset's got earlier. The dodgy-looking week in late September was thanks to two days when the cablecar was mostly suspended, and the really good week in early November was half term. Let's call it 42,000 passengers a week, on average, since the Games. That's 6000 passengers a day. That's about 500 passengers a hour. That's about 8 passengers a minute. And that's approximately one and a bit passengers per gondola. This might be busier that you're expecting. It's the equivalent of every flight across the Thames actually having somebody on it. Weekly totals at each terminal are about the same as you'd find using the tube at Rickmansworth, Brent Cross or Dagenham East. Numbers even compare favourably to the number 108 bus, which could carry more than 500 passengers an hour through the Blackwall Tunnel but generally doesn't. Or this might be less busy than you're expecting. It's only 10% of the total capacity TfL claimed the cablecar would provide. Numbers are way down on the 180,000 passengers carried in the peak week of the Olympics, or the 100,000 in the non-Games bit of August. And 500 passengers an hour is piddly compared to the Jubilee line which can carry that in a single train. But these weekly totals hide significant daily differences. The actual ridership for each day since the Paralympics has been extracted by London Assembly member Darren Johnson, and you can see all the numbers in a table on the Mayorwatch website. Again they vary a bit week by week, thanks to windy days and half term, but there's enough data to work out a fairly decent average. I've used the median, rather than the mean, rounded off to the nearest 500. Like so. At weekends the cable car is well used. It attracts over 1000 passengers an hour on a Saturday, which is about 20 passengers a minute, and a little less on a Sunday. But on weekdays, the cable car is not well used. Mondays are particularly low, while Fridays are a bit higher, but on average that's still only 3500 passengers each weekday. That's just 250 an hour, or about 2 people in each direction every minute. 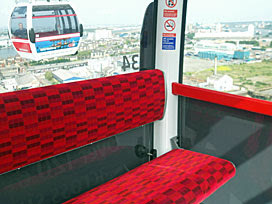 On weekdays the cablecar is carrying mostly empty seats. And that's strange because, if you remember, the cablecar was supposed to be an important new commuting option. Seems not. Darren's FOI request asked TfL how many people were buying a "Multi Journey Boarding Pass" (a carnet of ten cut-price tickets), and that's averaging only 50 sales a week. Meanwhile Darryl has detailed Dangleway data for the third week of October, and has discovered that only sixteen passengers used the service enough to claim a discounted Oyster fare. If the cablecar were a genuinely useful service for commuters you'd expect to see strong traffic numbers in the morning rush hour. Not so. Darryl's data shows an average of only seven passengers riding the cablecar each weekday before 8am, another 22 in the hour before 9am, and 49 more between nine and ten. That's a peaktime onslaught of just 78 people - about forty in each direction - which is barely worth firing up the system for. Numbers will pick up, says Dangleway boss Danny Price. "As with all new transport links, the number of regular users builds over a period of time as people become familiar with new journey possibilities for both work and pleasure." Alas he's wrong, at least on the work front. The cablecar creates no logical commuting path for "regular users", because it doesn't quite link anywhere useful, plus Londoners aren't keen on forking out additional cash on top of their hard earned Travelcard. Instead numbers are actually dropping over time, because numbers are related to how sunny it is, and whether children are off school. Expect January's figures to look quite bleak. How's the cablecar doing? About as poorly as might have been expected.